Thurber's Thoughts: How much will Obamacare raise your health insurance premium? Constitution Day 2013 - how much do you know? How much will Obamacare raise your health insurance premium? 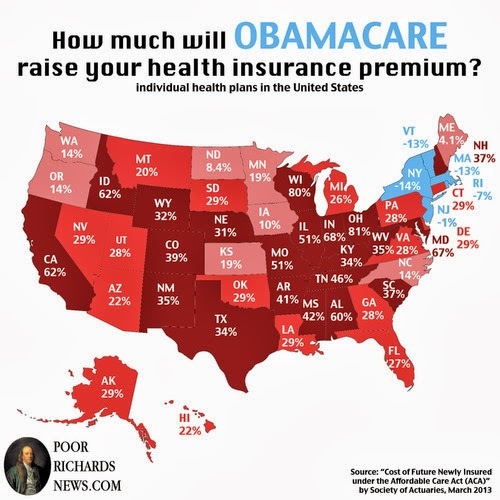 I wanted to share this Independent Journal national map which shows the projected insurance rate increases under the Affordable Care Act, commonly referred to as Obamacare. This isn't a partisan map. It's produced from numbers crunched by the Society of Actuaries. An actuary is a business professional who analyzes the financial consequences of risk. Actuaries use mathematics, statistics and financial theory to study uncertain future events, especially those of concern to insurance and pension programs. They evaluate the likelihood of those events, design creative ways to reduce the likelihood and decrease the impact of adverse events that actually do occur. SOA members work in life insurance, retirement systems, health benefit systems, financial and investment management and other emerging areas of practice. The majority of actuaries work within the insurance industry, although a growing number of actuaries work in other fields. Taken together, the study predicts that shifts of currently insured people from high-risk pools, the employer market, and previously uninsured persons who must pay most or all the cost of coverage to the individual market, will overwhelm the expected lower costs anticipated by the influx of newly-insured persons in the exchanges receiving federal benefit and premium subsidies. As a result, the underlying claims cost of insurance in the individual market will increase by an average of 32 percent nationally, when compared to what it would have been without the reform law. “In simplest terms, the states that will see large increases generally have low current individual costs and those showing decreases have high current individual costs, with all states moving closer together but at a higher level overall,” Bohn added. In some cases, the model projects that currently low-cost states, such as Ohio and Wisconsin, could see increases of 80 percent, while other currently high-costs states, such as New York and Massachusetts, may see double-digit decreases. We really can't afford this.